A monotypic genus of southeastern North America, by some authors placed in the Haemodoraceae. Conostylis americana Pursh, Fl. Am. Sept. 224. 1814. Lophiola aurea Ker, Bot. Mag. pl. 1596- 1814. Lophiola americana Coville, Mem. Torr. Club 5: 118. 1894. Stem stiff, erect, terete, glabrous below, white-woolly above, 1°-2° tall. 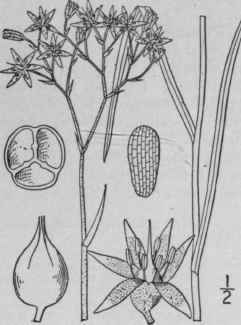 Leaves equitant, glabrous, much shorter than the stem, the upper ones reduced to bracts; panicle densely white-woolly, composed of numerous few-several-flowered cymes; pedicels short, rather stout, erect or ascending; perianth-segments linear-lanceolate, about 2" long, woolly outside, longer than the stamens and with a tuft of wool at the base within; capsule about as long as the persistent style, shorter than the perianth. Pine barren bogs, New Jersey to Florida. June-Aug.